We are a leading Manufacturer of on line pvc pipe printing machine from Ahmedabad, India. 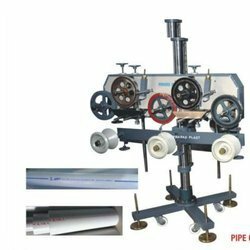 On line Pipe Printing Machine With the continuous support of our adept and seasoned professionals, we are devoted towards offering a commendable range of RPVC & UPVC PVC Pipe Online Printing Machine . Our provided machines are widely used in pipe manufacturing industries for printing the company logo and other related details on pipes during production. In line with clients' variegated requirements, we offer these machines in various technical specifications. Our provided machines are available in the market at market competitive prices.